Henry Howarth, the Earl of Grinstead, cares for no one. Caring causes pain and he has experienced enough of that to last a lifetime. Spying for king and country keeps his mind focused and his heart firmly locked away. Miss Millicent Holland is a companion, running away from her past. Joshua Shambles is out to get revenge and he is a man with no conscience. Unwittingly, Henry puts Milly in danger and feels compelled to protect her, refusing to acknowledge it is anything other that duty that is motivating him. Dealing with the past while facing the real dangers of the present, Henry and Milly are tested beyond anything they have experienced before. Both will be changed beyond recognition in this novel of love and loss. I am loving this series by Audrey Harrison. It is full of romance and intrigue, my favourite kind of regency set historical. The narration is excellent. I always enjoy books performed by Melanie Fraser and I am enjoying this series immensely. Her voice really suits this genre and she is a very easy listen. I enjoyed Millie and the Earl's story. They are two very likeable characters and I couldn't help but be swept along in their adventure. The fact that Millie's life was in danger added to the excitement and kept me hooked. I loved all the suspense towards the end of the book and the romantic ending left me feeling happy. 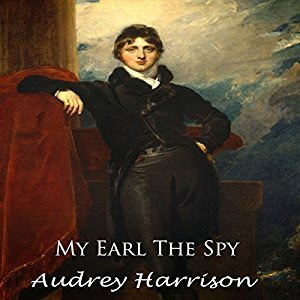 I'd recommend listening to the first book, My Lord the Spy, first- simply because it's equally as good and the characters, including the villain, are introduced there. Listeners who prefer historical romance without 'the naughty bits' will appreciate and enjoy this book.